Boil milk and chill it. Wash & peel the apples well . Scoop out the seeds portion. Puree it in a mixie with water, chilled milk and sugar. Strain and add ice cubes while serving. Add more milk or water to get the desired consistency. The recipe seems healthy and yummy. 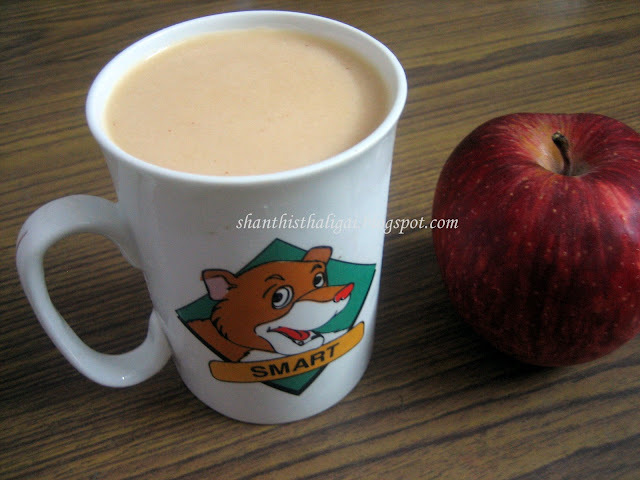 Looks wonderful Maami - easy and Healthy recipe! I want this milkshake rite now...refreshing drink!! healthy and yummy drink. I love that cup! Wow, that's one healthy milkshake. Great way to use apples before they go bad..lol. nice rich and energetic drink!!! aunty n i wud lik to know the preparations of les time cosumin breakfasts,lik easy n fast cookin bfs.